Details: This lovely portrait of Princess Alexandra when Princess of Wales is surrounded with roses to reflect her love for this flower - subsequently, she founded Alexander Rose Day in 1912. Daughter of King Christian IX of Denmark, Princess Alexandra married the then Prince of Wales, Edward, in 1863, becoming Queen from 1901 to 1910. She was renowned for her gentle nature and good works, especially in hospitals, and also for her love of roses. She was hugely popular with the public, all the more so as she bore with great dignity the infidelities of her husband. In 1902, she founded the Queen Alexandra’s Royal Army Nursing Corps, and in 1912 inaugurated Alexandra Rose Day in aid of hospitals. She died widely loved and respected in 1925. The portrait is signed and dated 1885. The artist Henry Campo-Tosto (anglicised to Campotosto) was born c1850 in Brussels, where he studied. He moved to London in c1875, and lived with his sister Octavia, a fellow artist, at 7, Kensington Gardens Square until 1893 when he moved to Bletchingly. He exhibited at the Royal Academy, at Suffolk Street and also in Paris. 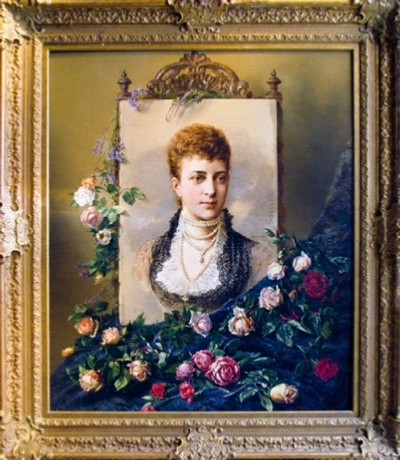 The provenance of this lovely portrait, executed in 1885, is not known. Clearly it reflects her love of roses, and it seems possible that it was painted for one of the hospitals or nursing charities with which she was associated. It is signed and dated in full.